Madison Bikes had their annual meeting last Monday. We approved our 2018 budget and had elections for our board of directors. We're excited to have several awesome new board members -- stay tuned for an official introduction when they take office in January. And thanks to everyone who applied but wasn't elected this time, as well as our outgoing board members. On Friday, Revolution Cycles once again hosted Art Pedaler, showcasing various kinds of bike-related art from local artists and makers. Thanks for organizing! Winter Bike Fashion Show is over -- time to start planning Winter Bike Week! The Madison Bikes Events Committee is going to meet on Monday to make plans for Winter Bike Week. Join them at Cafe Domestique at 6pm. Winter Bike Week is going to take place from February 2-9 2018. Also on Monday, is the weekly MEATHead ride, a casual loop around Lake Monona. Looks like the temperatures will be unseasonably warm that night. Depart at 7pm at Ford's Gym. Another opportunity for a social ride comes Tuesday: Bike Benefits, Down With Bikes, and DreamBikes are teaming up for a holiday ride/potluck/open shop night. Meet at Colectivo on the Square at 6pm. If you're a regular user of the Cap City Trail on the east side, on Wednesday you should attend a public meeting. The city has plans to improve the crossing of the trail and Atwood Avenue, near Winnebago and Riverside. 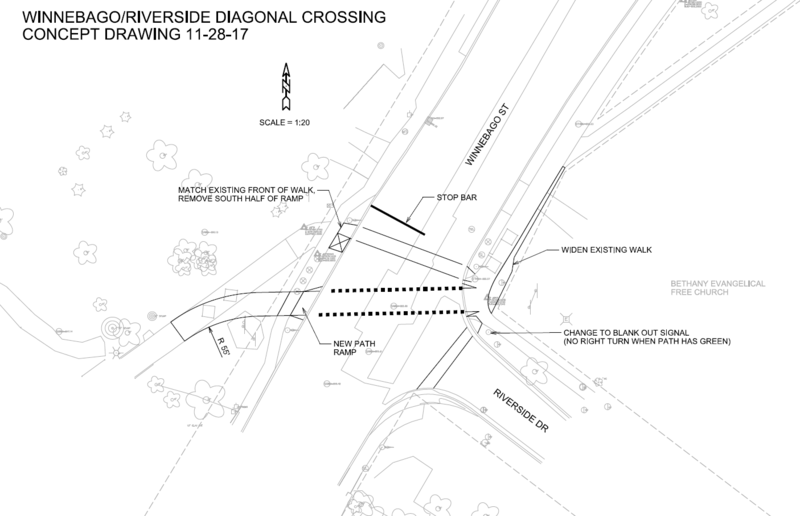 Instead of the sharp angles of the current crossing, the city is proposing to shift the alignment of the path and create a diagonal crossing. Unclear so far is if they're also planning to address the missing connection from the path to Winnebago. At the moment your options are either to ride on a narrow sidewalk or to cross Atwood twice. 6pm, Bethany Evangelical Free Church. On Thursday, it's winter solstice -- and the annual tradition of the Fantasy in Lights Ride. 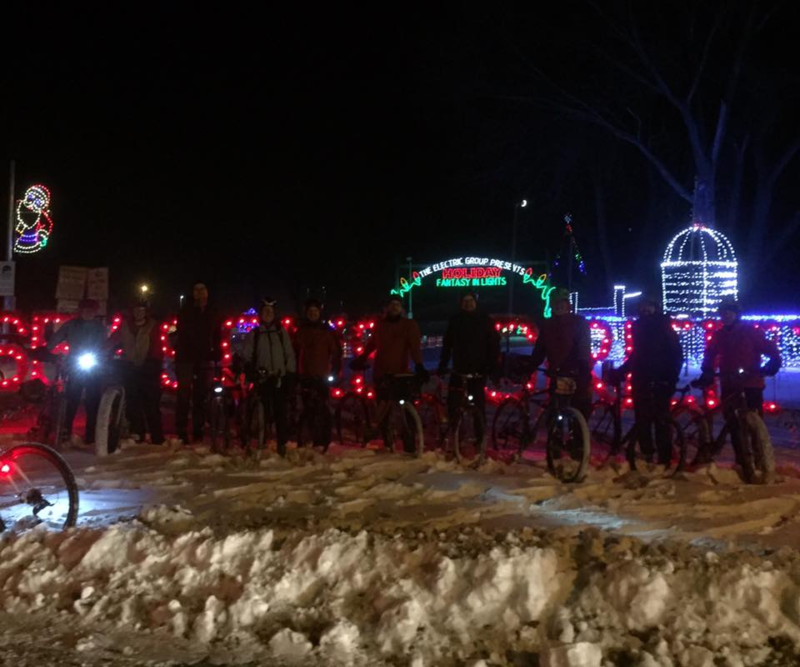 Madison Bike Winter invites you to come to Rockhound Brewing on Park Street at 5:30 and then ride together to the Fantasy in Lights display at Olin Park.